A retracement occurs when a trending stock revisits recent trading prices. When a stock makes a higher intermediate high and then a higher intermediate low, it’s a retracement. A trading range can also be considered a retracement. You may hear a retracement called a price consolidation or a pullback, but the concept is the same. Flags and pennants are relatively simple forms of retracement patterns. More complex retracements can occur within the confines of a trend, and like their simpler counterparts, they don’t actually signal the end of the trend. Unfortunately, complex retracements cause confusion and consternation for traders when they occur. Besides being difficult to anticipate, they send out conflicting signals to traders trying to make sense of which trading-plan adjustments are needed. In an uptrend, you sometimes see breaks in the pattern of higher highs and higher lows when the stock price fails to reach a new high or makes a lower intermittent low. You may see several occurrences of these worrisome lower lows and lower highs happen one right after the other followed by a resumption of a strong uptrend. You will see a couple of these benign multistep patterns frequently occur in the midst of a strong trend, so it is useful to watch for them. A three-step retracement makes at least one lower intermittent high and one lower intermittent low. A five-step retracement makes two lower highs and two lower lows. Multistep retracements also occur when a downtrending stock makes higher highs and higher lows. This five-step retracement ultimately resolves in the direction of the prevailing trend. The five steps are identified, along with the corresponding intermittent highs and lows. Situations like these are disconcerting whenever you’re holding a position. They’re not, however, absolute signals that a trend has reached its end. Knowing when a trend has ended, however, is nearly impossible, so you need a plan for dealing with it when it happens. Where the multistep retracement occurs within a trend has some bearing on what plan you choose. If the stock price has just broken out of a long trading range and then falters, you may want to wait for a subsequent attempt to break out of the trading range, but closing the position is probably best. Look for trading opportunities elsewhere. 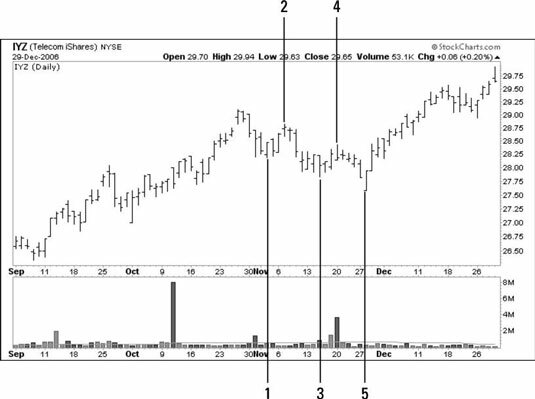 If a stock price starts what may be a three-step or a five-step retracement after a long period of trending, and your position is profitable, you may want to see how the retracement plays out. Absent any obvious sell signals, such as an island reversal or a downside breakout from a flag, pennant, or trading range formation, you can wait to see how the retracement resolves itself. Checking out a chart that reflects a longer time frame is helpful. You can examine a weekly chart when the retracement occurs on the daily chart. If the trend shows no signs of faltering on the weekly chart, hold your position. If the stock recovers and heads higher, so much the better, but if it establishes another lower high and trades below its next lower low, it’s time to exit. Finally, considering fundamental factors before making your decision makes sense. If a company’s deteriorating financial situation is an underlying cause of the retracement, then you want to exit your position. You also need to be aware of the cycle the economy is in when making your decision. If the economy is approaching a turning point as your stock’s technical situation deteriorates, getting out of the position is a good idea. A trading range or a cup and handle formation are also complex consolidation patterns. A trend that’s interrupted by a period of range-bound trading may indicate either a pause before the trend resumes or the end of the trend. The only way of knowing which way the trend will go is to watch for the breakout. Unfortunately, you may be in for a long wait. In the retracement pattern, you can make a valid argument interpreting the five-step retracement as a cup and handle formation. Technical analysis is an imprecise discipline, so you may encounter ambiguous situations like this. The results in this case were the same regardless of your interpretation. The stock broke out of its nine-week complex consolidation pattern and resumed its trend. Breakouts that occur in the direction of the prevailing trend may indicate that the trend has further to run, but they may also be a prelude to a failed breakout signal. Trading-range breakouts provide the strongest signals when they result in a change of direction from the previous trend.